Oklahoma City - The Oklahoma City Dodgers scored five runs in the seventh inning, including a three-run home run by Will Smith, to win their series finale against the San Antonio Missions, 5-4, Monday afternoon at Chickasaw Bricktown Ballpark. The Dodgers trailed, 3-0, entering the seventh inning. Rocky Gale and Paulo Orlando then each drew walks for Oklahoma City before infielder Daniel Castro lined a RBI single into left field to put the Dodgers on the scoreboard. Matt Beaty followed with a RBI single on a grounder into right field before Smith hit a fly ball out to left field for his first home run of the season and put the Dodgers in the lead, 5-3. San Antonio's Keston Hiura hit a pinch-hit solo home run in the top of the ninth inning to cut Oklahoma City's lead to one run, but Dodgers pitcher Stetson Allie retired the next three batters for his second save of the season. The Missions (3-2) got on the board in the fourth inning via a RBI double by Nate Orf and a sacrifice fly by Lucas Erceg to take a 2-0 lead. Monday marked the fifth time in the first five meetings between the teams that the Missions scored first. Erceg's RBI double to center field later extended San Antonio's lead to 3-0 in the sixth inning. The Dodgers (2-3) drew three straight walks to open the bottom of the sixth inning and load the bases, but were unable to bring home a run as a fielder's choice and double play ended the inning. They then scored five runs on three hits in the seventh inning to take the lead as they closed out their season-opening series against San Antonio. Dodgers reliever Layne Somsen (1-0) picked up the win in his first appearance with Oklahoma City this season, pitching a scoreless and hitless seventh inning with two walks and one strikeout. Missions pitcher Jon Olczak (1-1) was charged with the loss, allowing all five of Oklahoma City's runs over 1.1 innings of relief. 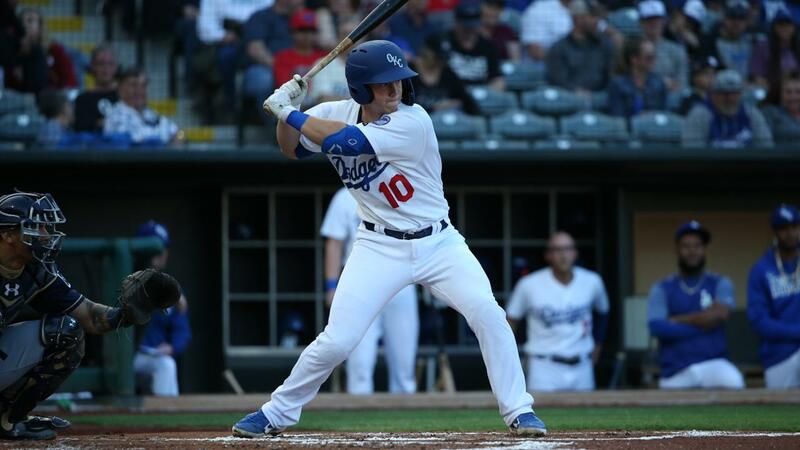 The Dodgers next head out on their first road trip of the 2019 season and open a three-game series against the Omaha Storm Chasers at 6:35 p.m. Tuesday at Werner Park.